Gregor Blanco got the leadoff hit and one out later Paul Goldschmidt drew a walk and Jake Lamb followed with a three-run homer. Lamb went on to homer later in the game, his first career multi-homer game, and has homered in three straight games. Lamb felt like he was late with his swings when he was struggling, so last weekend he made a visit to what he called the “velo machine” with hitting coach Dave Magadan. After Lamb’s three-run homer, Yasmany Tomas drew a walk and Brandon Drury then hit a two-run shot. “Anytime you hit through the order it’s always fun, and it’s just fun to win games,” Drury said. Even pitcher Taijuan Walker got into the action in the first with an RBI single. 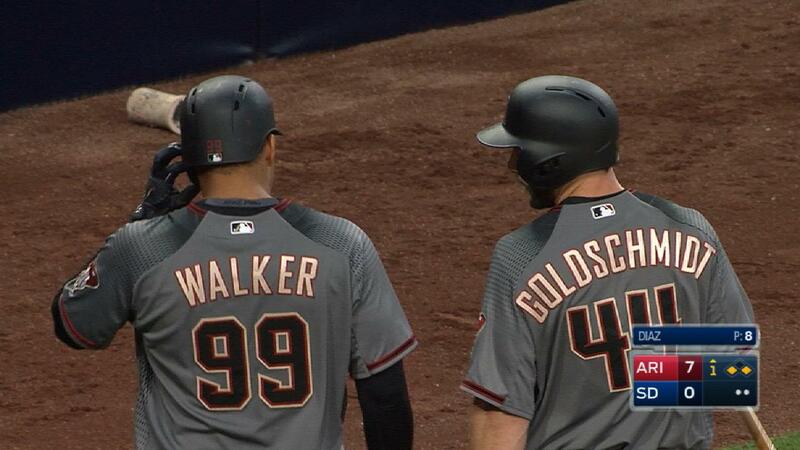 Walker, who spent his career in the American League before last December’s trade to Arizona, tweaked his back earlier this year while swinging, so he’s been extra cautious at the plate. All week his teammates had been giving him grief about not putting his legs into his swing. The D-backs’ offense has been potent at home, but has not been as successful on the road. The 10-run outburst has them hoping they’ve finally turned the corner on that. Steve Gilbert has covered the D-backs for MLB.com since 2001. Follow him on Twitter @SteveGilbertMLB. This story was not subject to the approval of Major League Baseball or its clubs.